Whether or not you have experience of diving in British salt water you are welcome to join Big Squid on a weekend scuba diving trip to Portland. 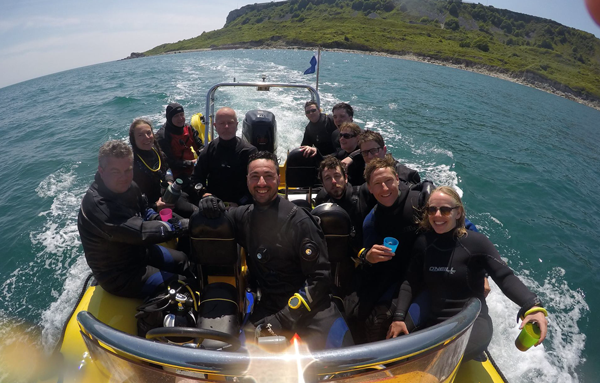 We usually dive around Portland Harbour or Balaclava Bay. With 4-5 dives over two days on a mixture of dive sites comprising wrecks and reefs. We arrive on Friday evening and stay for 2 nights in dorm or twin share accommodation in the Royal Breakwater Hotel which is steeped in rich naval history. On this trip it is possible to undertake a variety of Speciality courses. Accommodation, breakfast, boat fees, air, tanks and weights. Transport, lunch, dinner, equipment hire: £25 per day, wetsuit hire: £20 per day dry suit hire £35 per day. Sometimes the wind can be too strong for our trip to go ahead. in theses cases the trip cost is refundable apart from the accommodation component of the trip price. The accommodation remains yours to use for a weekend by the sea. Refunds for cancellations made in advance of the balance due date can only are given once the trip is full and another diver has taken your place. For cancellations made after the balance has been paid, no refund can be given until your place is sold to another diver. It is important you listen carefully to all safety briefings while you are on this trip and follow the instructions you are given at all times, both in and out of the water. Make sure you dive within the limits of your dive certification, experience and comfort level.